Though some of you have expressed a desire to see Ecocentric move past the ongoing nuclear crisis in Japan, we’re not quite there yet. The good news is that crews have begun to restore power to the reactors, which should help accelerate the efforts to restore cooling to the still hot—and radioactive—nuclear fuel. Elevated radiation levels have been found in seawater near Fukushima—but experts say it’s unlikely to pose a health risk to the public through seafood, either for Japanese or for export markets. The spent fuel pools and hot reactors are still a threat—black smoke was seen rising from Fukushima Daiichi’s number three reactor, and elevated levels of radioactivity were detected in Tokyo tap water. 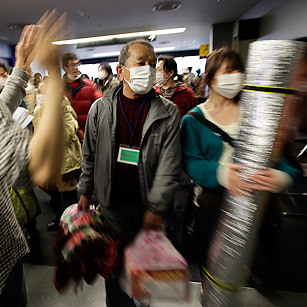 But nearly two weeks after the nuclear crisis began, the fear levels—if not the radiation levels—have begun to lessen. What happened on March 11 in Japan, and in the subsequent days, was something that had never happened before: the world’s first complex megadisaster, in Redlener’s words. The megadisaster part was undeniable—the quake was the fourth-strongest in recorded history and has left at least 400,000 Japanese homeless. But megaquakes and megadisasters aren’t new—last year’s quake in Haiti, which virtually decapitated the island nation, is another example. What is new—and complicating—is the nuclear. As complex as this megadisaster has been, however, no country should have been as prepared as Japan. Redlener pointed out that Japanese are experienced with quakes, live in buildings designed to withstand tremors, are engaged with disaster planning and have proven their resilience in the face of crisis time and time again. “The whole country gets into being prepared and being able to tolerate stress in a way that other countries can’t,” he said. One major bottleneck has been Japan’s fondness for red tape. “In special times, you have to do things in a special way,” says Kensuke Kobayashi, an IBM employee in Tokyo who has tried to organize relief efforts to Tohoku from the Japanese capital. “But in Japan, there is a legal wall that stops everything.” Japanese shipping company NYK offered to provide a container ship for helicopters to land on when ferrying in relief supplies to coastal areas. But the government rejected the offer because the NYK shipmates lacked the proper licenses to help with such work. After some wrangling, volunteer foreign doctors were told that because they didn’t have Japanese medical licenses, they could conduct only the “minimum necessary medical procedures” in the disaster zone. Some medicine donations from overseas haven’t reached the many elderly suffering in the earthquake’s aftermath because Japanese regulatory agencies have not yet given the drugs approval. Local logistics companies have complained — off the record, for fear of angering the bureaucrats whom they depend on for future licensing — of days-long waits for permission from the central government to deliver donated goods. Only when their trucks get the magic pass can they start moving toward Tohoku. Until then, the boxes of relief goods, some of which were donated just hours after the earthquake and tsunami hit, sit in Tokyo warehouses. It might seem surprising—Japan is supposed to be the land of ultra-efficiency, of Toyota’s just-in-time manufacturing prowess and bullet trains that always run on the dot. And it is. But there have always been two Japans: the country that produces export champions that can beat the world, and an inward, inefficient domestic sector that drowns in red tape. It’s the latter Japan, unfortunately, that has handled the crisis so far—and the result, despite all the resilience of ordinary Japanese and the courage of Fukushima 50, has been lacking. Maybe that’s the lesson to be taken from the world’s first complex megadisaster. Prepare like the Japanese—but have someone else be in charge of the response.